The Calvert County Health Department, in conjunction with the Prince Frederick Rotary Club, Calvert Alliance Against Substance Abuse, Calvert Collaborative for Children and Youth, and the Calvert County Sheriff’s Office, is working to reduce underage tobacco use in Calvert County. Your tobacco license brings with it not only the right to sell tobacco products, but the responsibility to do so in accordance with the laws of the State of Maryland. Maryland is serious about keeping our kids tobacco-free and is increasing educational efforts and retailer compliance checks across the state. Understanding the roles retailers play in preventing tobacco sales to minors is essential. Ask for photo ID for everyone under 27. Check to make sure everyone is at least 18. 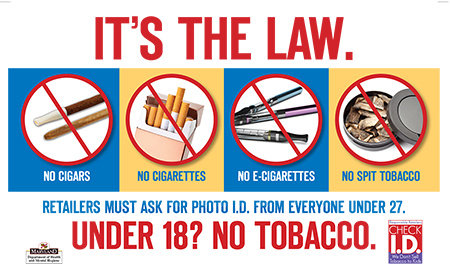 Refuse to sell tobacco and e-cigarette products to everyone under 18. To put it simply—selling, distributing or promoting tobacco and e-cigarette products to anyone under 18 years of age is illegal. We want to support you to comply with the law and help protect the health of your business, as well as the health of the Calvert County workforce. Your help in reducing tobacco sales to minors is vital. By using these materials, you will keep children from initiating tobacco use, saving Calvert County individuals and businesses millions of dollars in healthcare costs due to tobacco-related illnesses. This website provides materials and resources needed to train and educate retail owners and staff in order to remain compliant with all youth tobacco sales laws. We encourage everyone to utilize and share the resources provided. If you have questions or concerns regarding youth access to tobacco laws or retailer compliance, please contact: Jenn Faulkner, 410-535-5400, x357.